OMAHA, Neb. — Floodwaters have started to recede in Nebraska and emergency personnel can begin the great task of assessing the destruction, but estimates are increasing by millions every day. The Douglas County Unified Command Center is still in full operation. With waters going down, responders can get an up-close look at the damage instead of relying on aerial footage and witness reports. "It's very helpful to have those roads open because now we can get eyes on all those affected areas and those damages that we do see,” said Paul Johnson, Douglas Co. Emergency Manager. The Nebraska Emergency Management website indicates an early estimated statewide impact of more than $550 million on public property . The Douglas County numbers aren't in, but Sarpy County is already reporting $100 million in damage to public property. Johnson says they could easily surpass that number with the water treatment plant and some roads being destroyed. Douglas County Commissioners discussed funding at Tuesday's meeting. If the flooding gets a U.S. disaster declaration, the cost is shared with federal assistance paying 75 percent and the rest coming locally. The state and county or city would split the rest. Commissioner Kraft questioned if the state could come up with their part. “The money has to come from somewhere,” Kraft said. "We need to be prepared not just for additional costs this year but additional costs the next two or three or four years because this is not going to be solved overnight." Estimates continue to be gathered by counties and NEMA for damages. As of Wednesday afternoon, the private property damage estimate stands at more than $89 million. 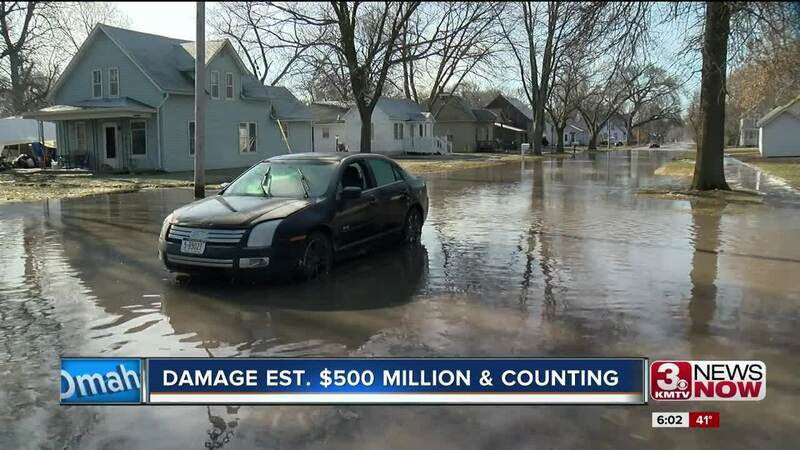 More than 7 million people were under flood warnings Tuesday, the National Weather Service said, as the heartland dealt with the aftermath of snow melt and a "bomb cyclone" that blasted the central Plains and Upper Midwest last week with heavy rain or snow. The flooding in Nebraska has been especially bad, with Gov. Pete Ricketts calling it the "most widespread disaster we have had in our state's history."